OHBLOGLAGI! 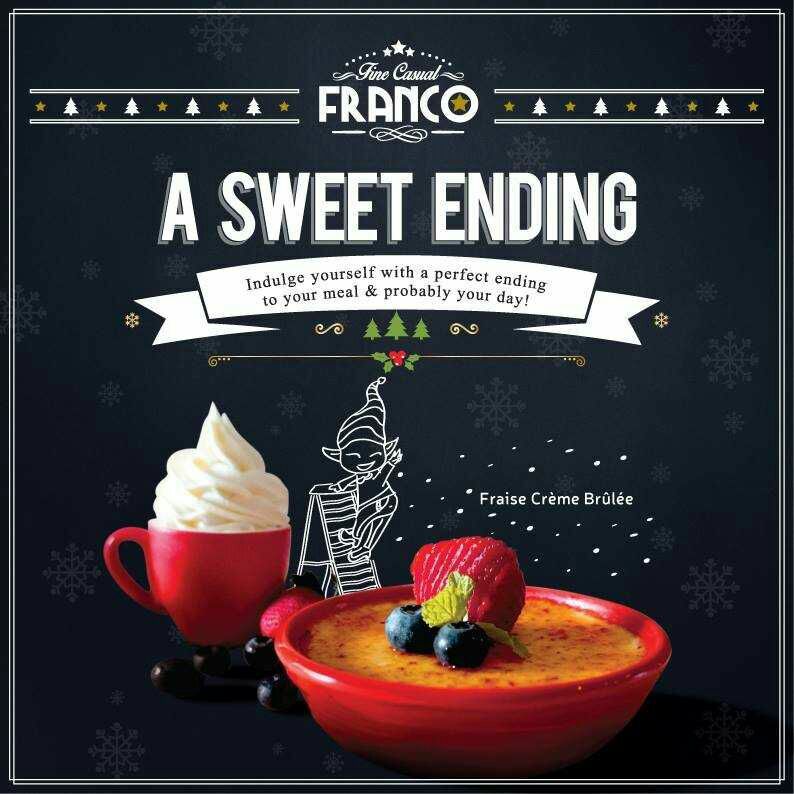 : Franco Malaysia A SWEET ENDING PROMO! Franco Malaysia A SWEET ENDING PROMO! Indulge yourself to a perfect ending to you meal & probably your day with our FRAISE CREME BRULEE @ RM8! (with any purchase of a main course). Available at all outlets! (except 1 Utama & Country Garden Danga Bay, JB). HO! HO! HO! FRAISE CREME BRULEE - A smooth & creamy baked custard topped with caramelized sugar, served with vanilla softee. Eat both together and feel the magic! FRANCO is a fusion fine casual dining restaurant that changes the notion of gourmet food - it is a unique dining concept that is set out to define a new dining experience, focusing on what matters most – quality food in a casual, comfortable environment and at an affordable price point. Promising a remarkable journey for the taste buds, FRANCO fuses artisanal cuisines and techniques with ingredients and cooking arts found globally. Marked by meticulously-concocted, delicious and wallet-friendly menu items, made using the freshest locally-sourced and imported high-quality ingredients, FRANCO seeks to put a new definitive on fusion dining. It's passion served on every plate - at FRANCO.